A nine year old cancer patient has asked for cards for Christmas after his parents were told he had just weeks to live. Jacob Thompson and his family will celebrate Christmas early this year after receiving the news that his neuroblastoma was incurable. 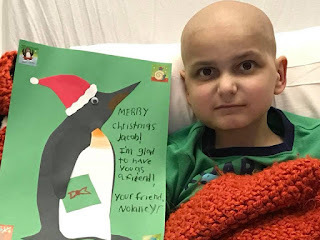 After receiving a slew of cards for Halloween Jacob said he wanted more for Christmas, which his family will celebrate this month, CNN reported. His father, Roger Guay, told the broadcaster: "He opened up and saw them and it was like getting a gift. He read it to us and had a big smile his face and his nose scrunched. "He was excited to see what people had to say and it just brightened his day." Some have featured penguins, Jacob's favourite animal. One card even came from Antarctica, alongside others from Australia and Denmark, according to Jacob's step-mother Tara Artinyan. To send a card to Jacob, use this address: Jacob Thompson c/o Maine Medical Centre, 22 Bramhall Street, Portland, ME 04102, USA.